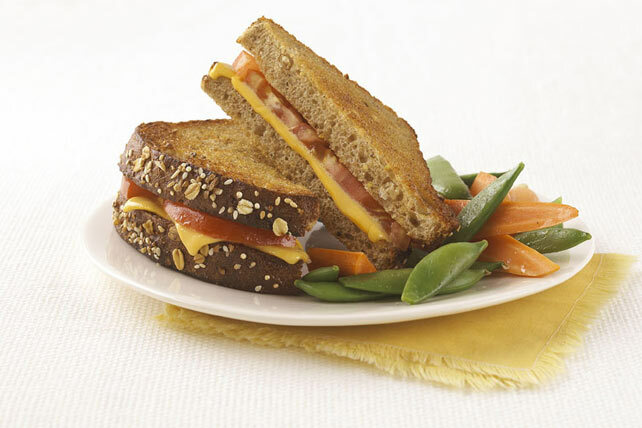 Update the classic grilled cheese with multi-grain bread and fresh tomatoes. Top 1 of the bread slices with Singles and tomatoes; cover with remaining bread slice. Spread outside of sandwich with margarine. Cook in skillet on medium heat 2 to 3 min. on each side or until golden brown on both sides. Serve with vegetables. Add sliced cucumbers, red pepper strips and/or fresh spinach leaves to the sandwich before grilling.